French truffle oil is one of those eye-catching ingredients on menus and in recipes that screams luxury, excess, an exotic, unknown taste that demands a standing ovation--and usually a higher price. Alas, as with many grand gestures and pretentious promises, it is mostly illusion. There are two kinds of truffles, the expensive European fungus, and the confection, so-called because it resembles the brown, round savory mushroom variety prized for its delicate, earthy taste. French truffle oil imparts foods with the flavor of a natural truffle. 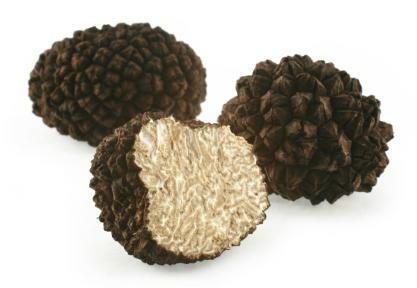 Truffles are highly prized fungi cultivated mainly in France and Italy. For centuries, specially bred pigs sniffed out the small growths of truffles that prosper beneath trees surrounded by soil rich in truffle-preferred nutrients. Although modern cultivation methods make truffles more readily available, they remain among the most expensive natural gourmet foods, costing an average of $30 an ounce. Since truffles are so expensive and hard to find, the invention of truffle oil enabled chefs to add the distinct flavor to dishes without the bother or cost of real truffles. Even though it is considerably pricier than other gourmet oils at around $17 for approximately 8 ounces, compared to the price of actual truffles, it's a bargain. There are no truffles in French truffle oil or any other kind of truffle oil, which quickly became obvious to more math-inclined chefs and consumers. When they pondered how the oil of a product that cost $48 a pound could be so low, research revealed that truffle oil was nothing more than olive oil or safflower oil infused with 2,4-dithiapentane, one of the many natural aromatics found in real truffles. Many chefs believe-or purport to believe-that truffle oil enhances the flavor of almost any savory dish and most consider French and Italian versions the tastiest types. The oil has little flavor but its scent tricks diners into "tasting" the earthy components of the real fungus. Not normally used during the cooking process, truffle oil is gently drizzled atop foods right before serving. Steaks as well as grilled fish and poultry gain an extra dimension when lightly sprinkled with truffle oil just prior to consumption. Stirring a tiny bit of truffle oil into a rich beef stew elevates it from hearty peasant food to a gourmet, slow-cooked menagerie of meats and vegetables. Both raw and cooked domestic and gourmet mushrooms burst with intense natural flavors with the addition of truffle oil. A drizzle of the topping on warmed artisan or garlic bread adds complexity. Pastas and risottos gain depth from a few drops of truffle oil, as do austere steamed vegetables and simple salads of mixed fresh greens. Because truffle oil is most aromatic when first poured from the bottle or carafe, it is often served as a special condiment on the side. Diners then add the truffle oil to the dishes of their choice. It is common for top chefs to be canonized for their insistence on only the purist, highest quality and most natural ingredients. It seems somewhat blasphemous that the majority of them still praise the attributes of truffle oil. While some have dramatically banned the oil from their kitchens and insist on using only fresh truffles to flavor their dishes, most have embraced the flavors of the chemically enhanced oil. A few chefs tried flavoring olive and safflower oils with fresh or dried truffles; however, since the flavor is so delicate, the chefs' attempts at infusion failed. Despite its dubious components, truffle oil definitely elevates many dishes from mundane to marvelous. For under 20 bucks, it's a good gourmet investment-a cup of truffle oil goes a very long way with doled out in delicious dribbles. Order a bottle or look for it in specialty food stores. Truffle oil is sure to impress guests at your next dinner party.